I purchased the hardener and resin and fiberglass cloth from US Composites. I chose 6 oz. 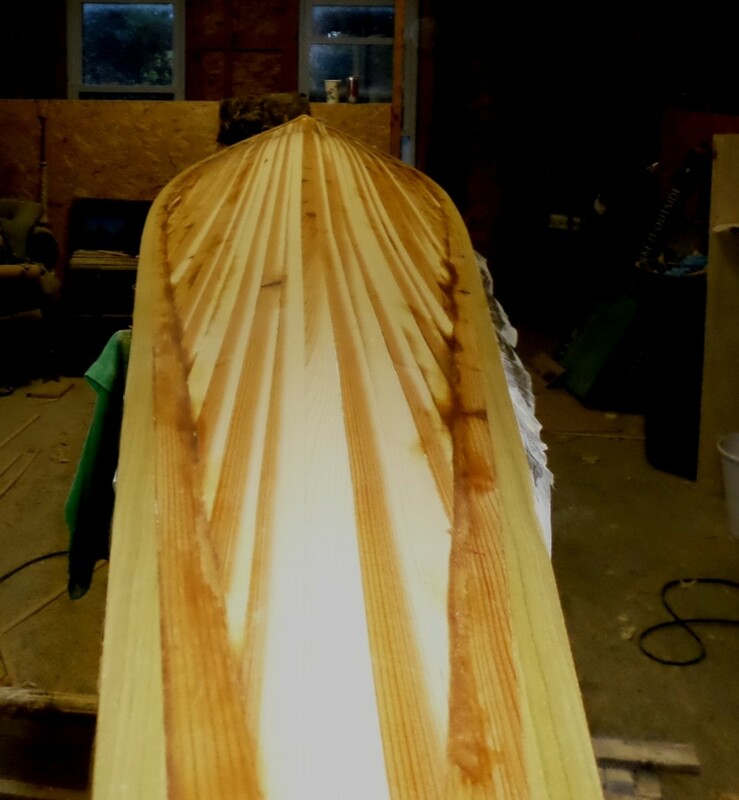 38” width e-glass for the exterior hull, and 4 oz. 30” width s-glass for the interior of the hull. S-glass has better strength and stiffness than e-glass. I chose 4 oz. e-glass 30 “ with for the top and bottom of the deck. I used the 3:1 ratio Medium 635 Thin epoxy system. I wanted to try to reduce the final weight of this boat. 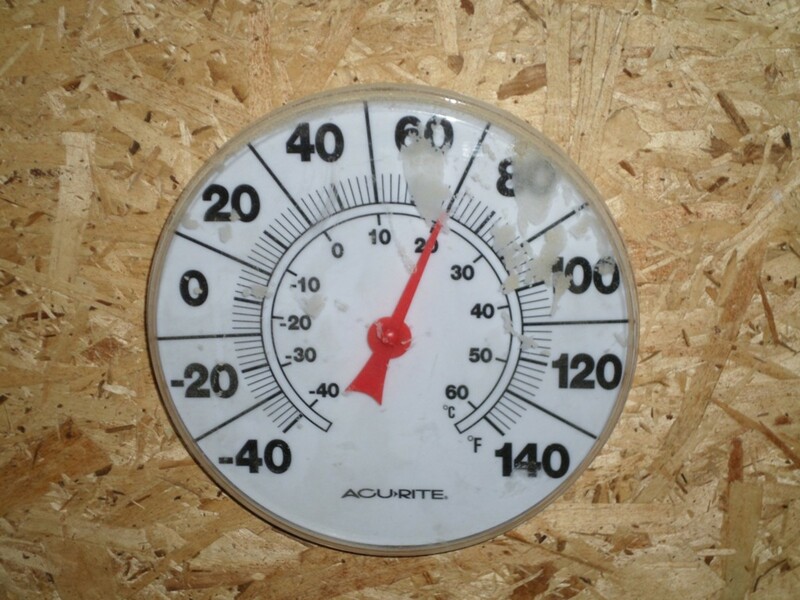 With this brand of epoxy, the best results are obtained if the ambient temperature is between 70F – 80 F. Take extra care not to screw up the resin to hardener ratio. That mistake is hard to fix. 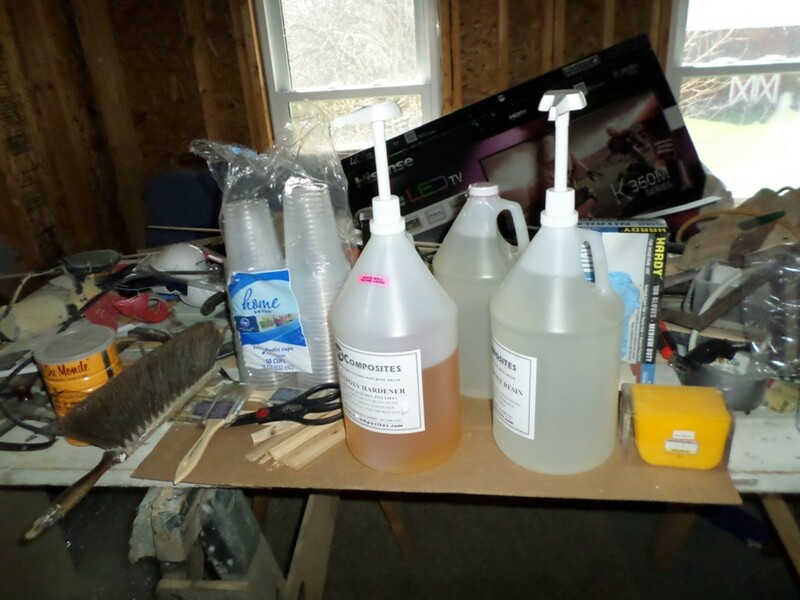 The epoxy was thoroughly mixed with a piece of scrap planking, in small batches (3 pumps of resin and one pump of hardener) into a plastic party cup. 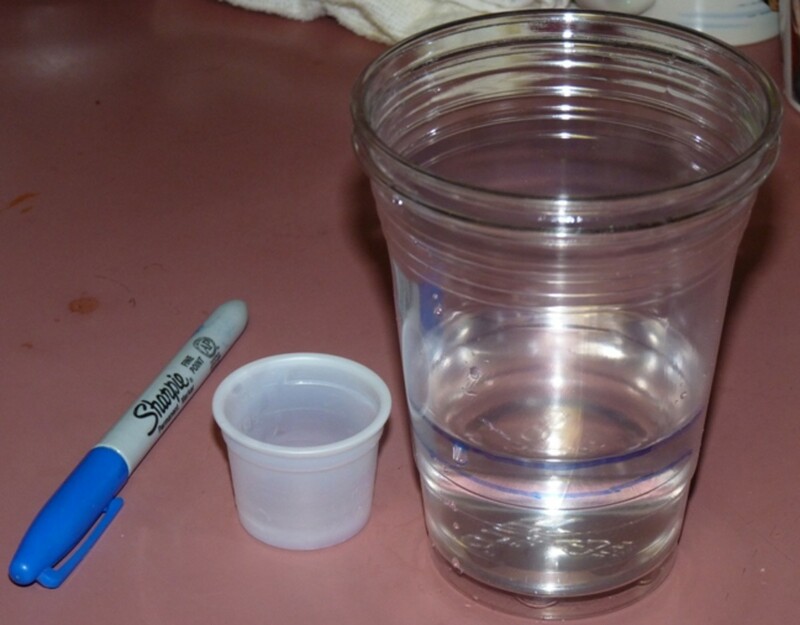 I use the clear cups so that if I need to mix a smaller batch I can mark the ratio on the side of the cup with a permanent marker that I premeasured using table spoons of water. The first step was to lightly brush the wood clean with a tack cloth so that is free of dust and other particles. I then rolled the cloth out over the hull and used a soft bristle brush to smooth out any wrinkles and make it lay as flat as possible on the wood. 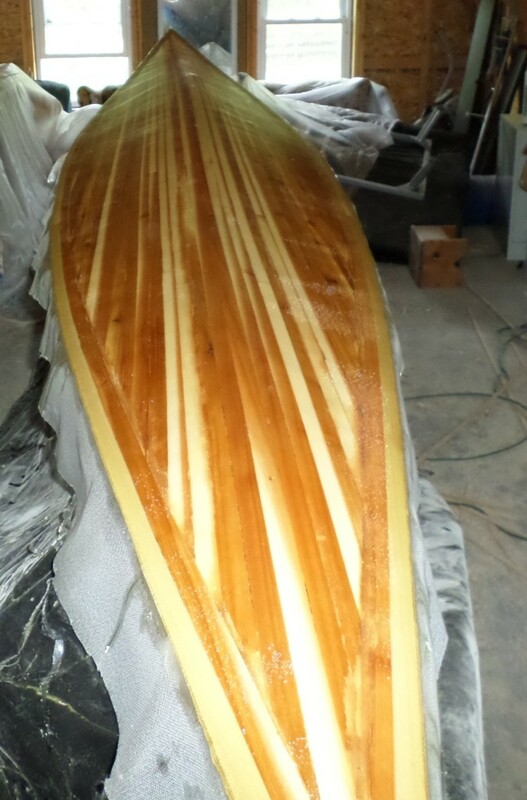 It was now ready for 3 coats of epoxy. I applied resin with a with 2” chip brush starting about ¼ of the distance from one end, then working from side to side and towards that end. 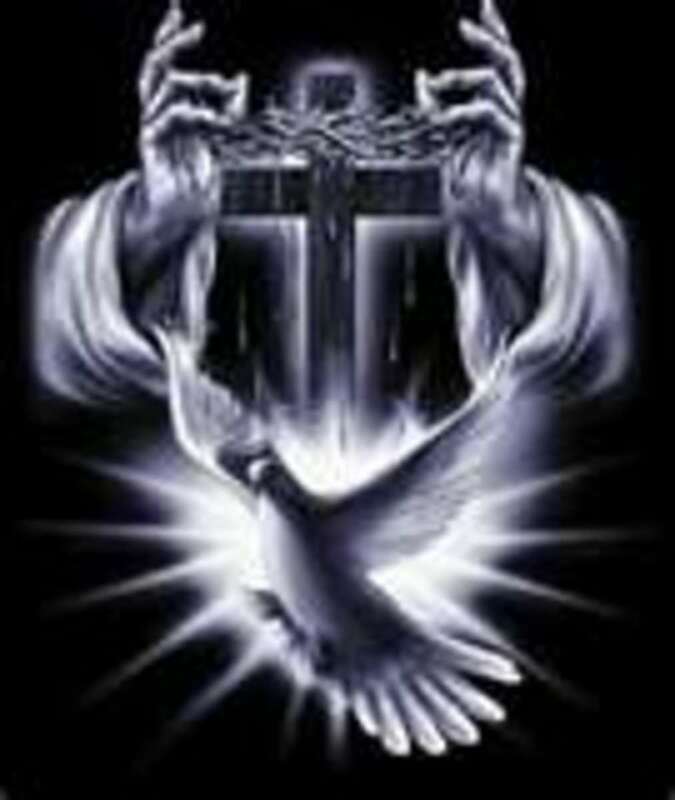 This anchors the cloth and keeps it from slipping. The epoxy should be brushed on lightly in liberal amounts, and brushed from wet cloth to dry cloth to avoid pulling and wrinkling the cloth. 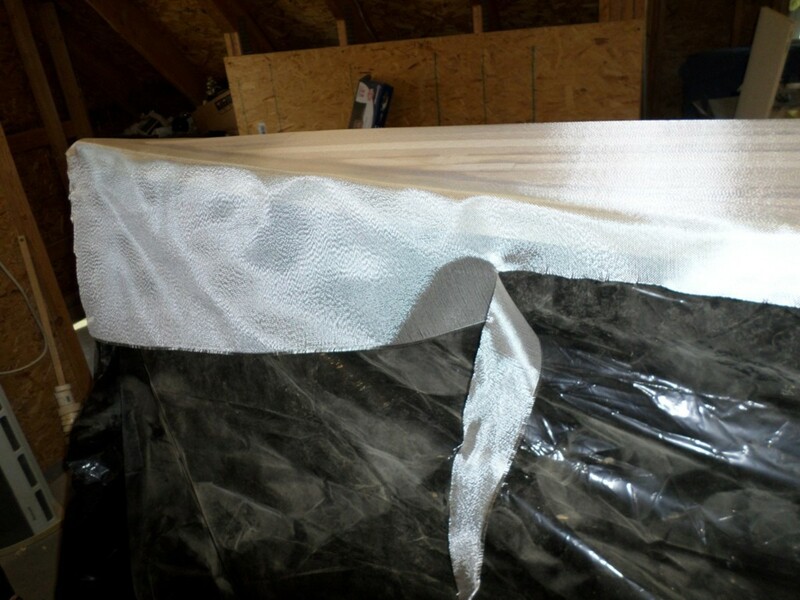 This first coat is to wet the cloth and wood and allow resin to soak into the wood. 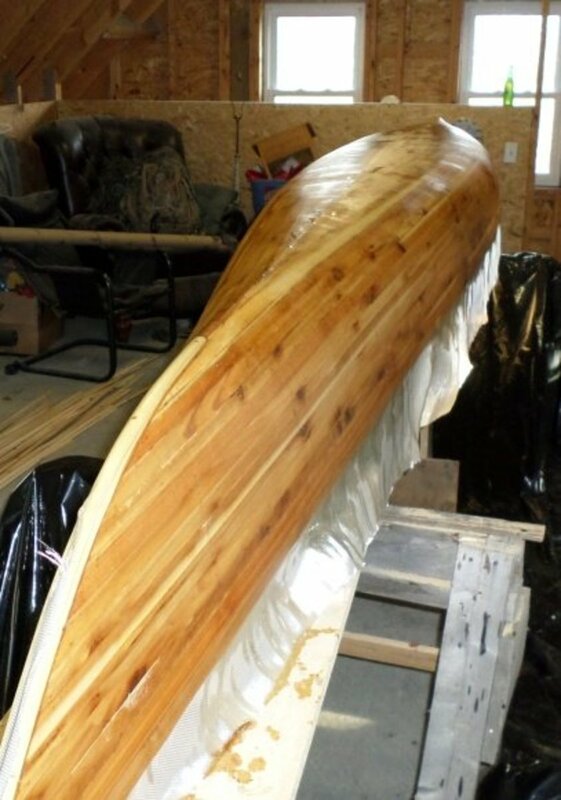 Once this quarter of the boat had the cloth wet, I applied resin to each side of about a 2 foot section adjacent to the already wet one. I then went back to squeegee out the excess epoxy on the first section, that by now, had been soaking for about 20 minutes or so. I used plastic squeegees held almost perpendicular to the cloth to gently pull the excess resin from the center line of the boat towards the edge into a plastic cup, working first one side of the hull, then the other. You want to allow time for the resin to soak into the wood so I applied it to another two foot sized section then went back to the previous and used the squeegee. 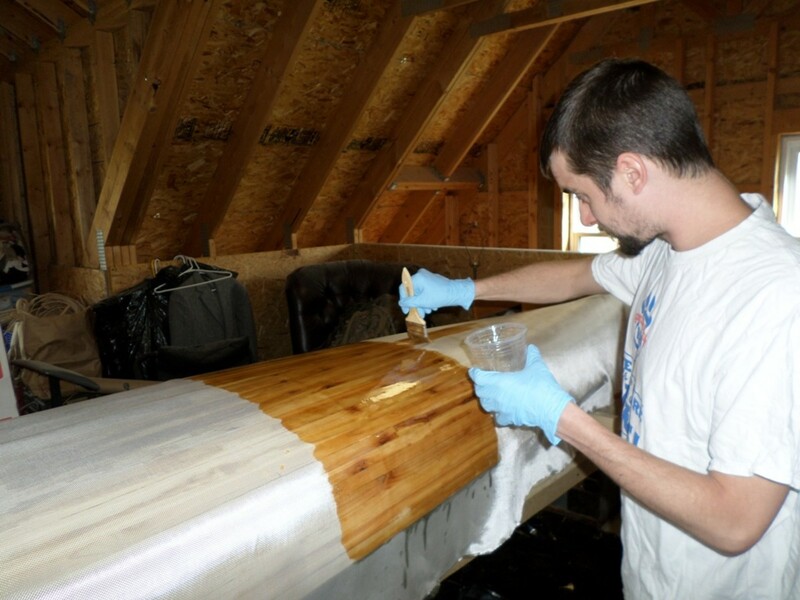 This process of alternate application a squeegee was continued until the hull was completed. This was the first coat, the wetting coat. You should be able to see the texture of the cloth when complete. I should have a dull finish. This was the second coat, the fill coat. Most of the cloth weave should now be less visible. 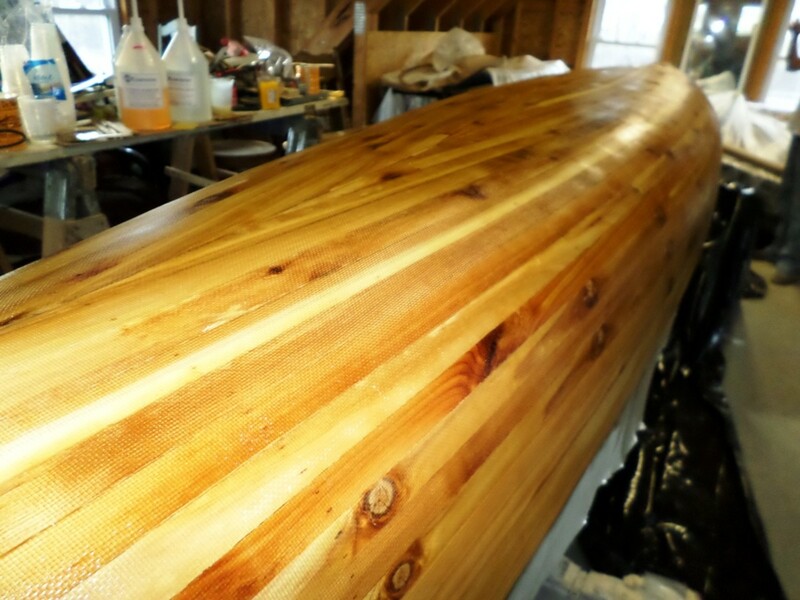 The third coat, the covering coat, was brushed on like painting a fence, only following the length of the planks. Once the entire hull was coated I went back several times as it cured to brush out any runs I could find. 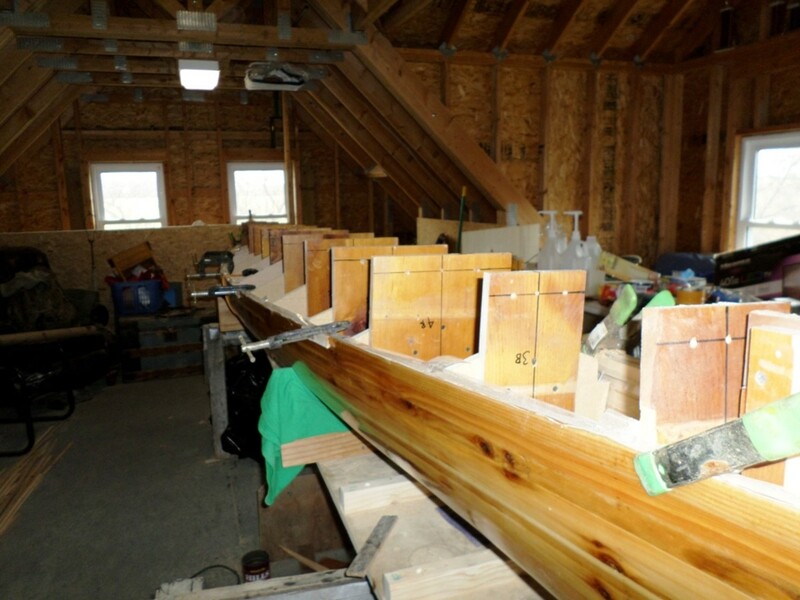 The hull needs to be flipped over now so that the deck can be planked. Remove the screws holing the form extensions to the station blocks. Make two C-shaped cradles from plywood, cover the edges with padding of some sort and attach them to the station blocks. You can use two of the forms to determine the size of the cradles. Place the hull in the cradles and remove all of the form extensions. The screws that held the forms to the sheer clam now need to be moved to the hull side. They should attach the edge of the hull to the forms. You will probably want to run a strip of plastic packing tape between the inside of hull and the sheer clamp to keep it from accidentally becoming glued to the lower hull. I did not use staples to attach the deck planks. I think this is a better look. 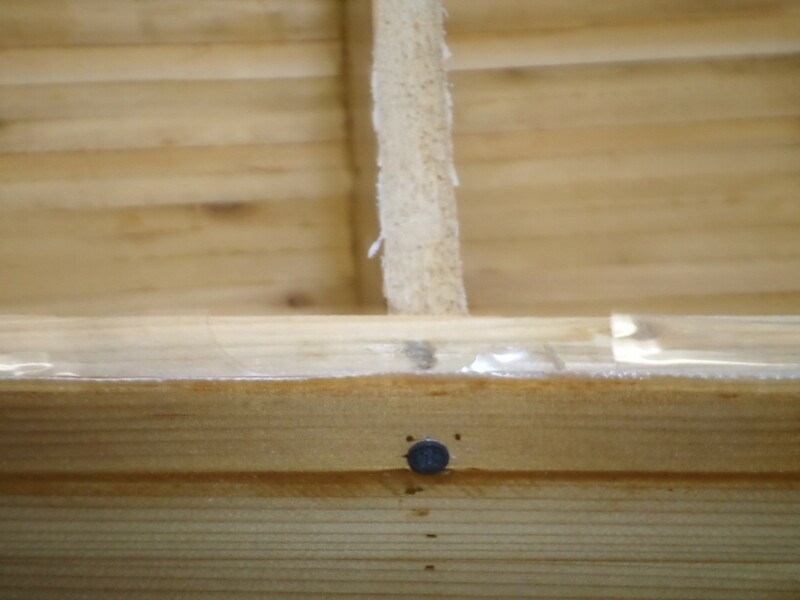 To begin planking the deck, I attached two strips on each side, which were glued to the sheer clamp. 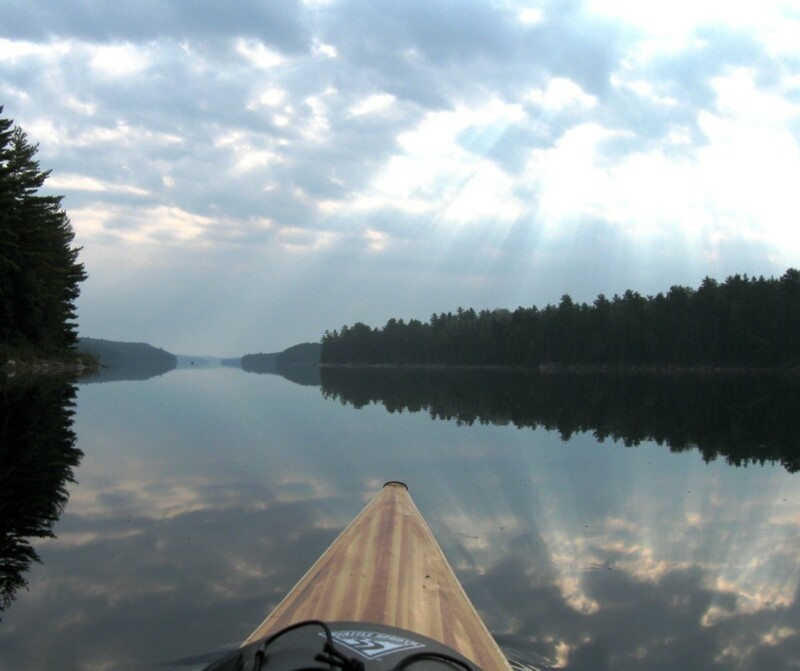 The ends are cut at an angle so that they join together at the end of the stern and bow. I used one contrasting strip of green poplar. The strips were held in place with c-clamps while the glue set up. The next strip to apply is called a king strip. It runs down the centerline of the deck from bow to stern. This can be a contrasting strip also. 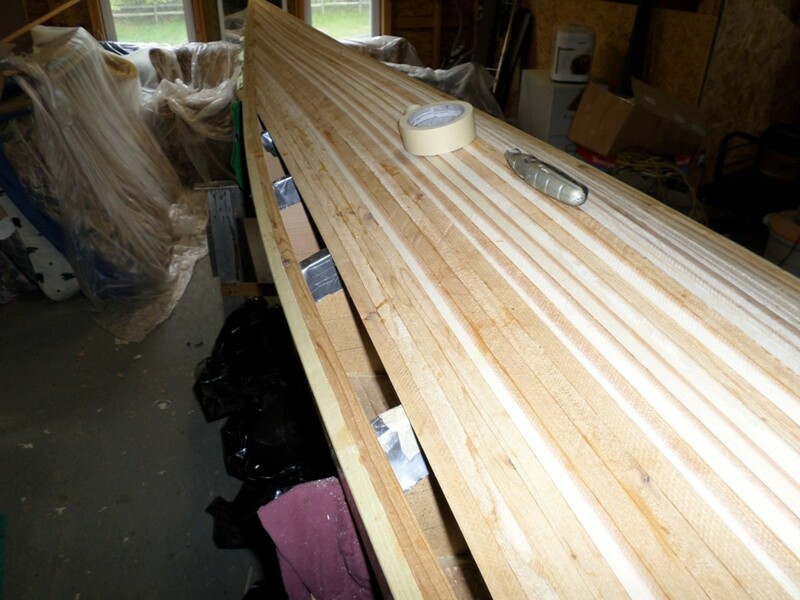 The remainder of the strips were then attached from the king strip towards the edge of the deck on each side. Then are attached so the angle cut to fit them is on the is on the deck edge side. Alternately you could start from the edge and work towards the king strip, so the angle cut is towards the center of the deck. The strips are held in place on the forms with L-shape pieces of scrap wood attached to the forms with C-clamps. Masking tape was also used to hold the strips together. Sometimes wedges, bungii cords, twine, extra tape and an occasional staple are needed. 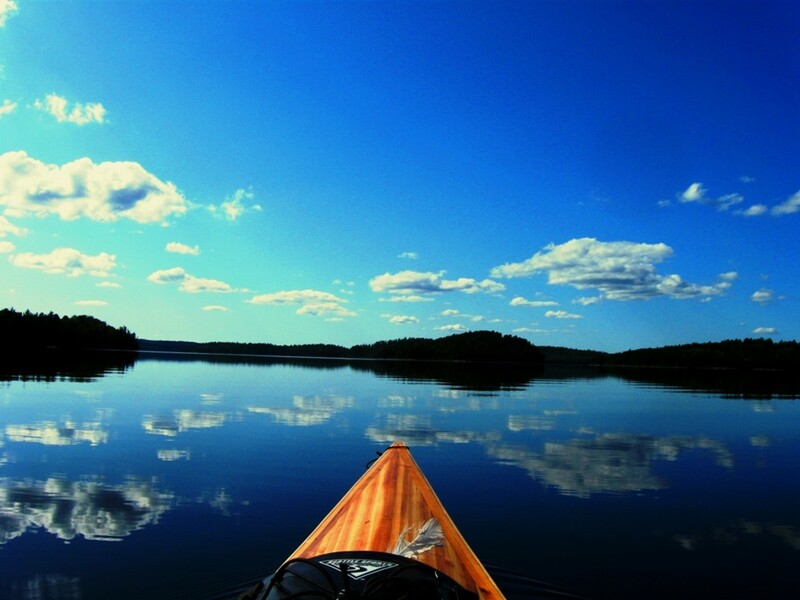 You will discover many creative ways to clamp. 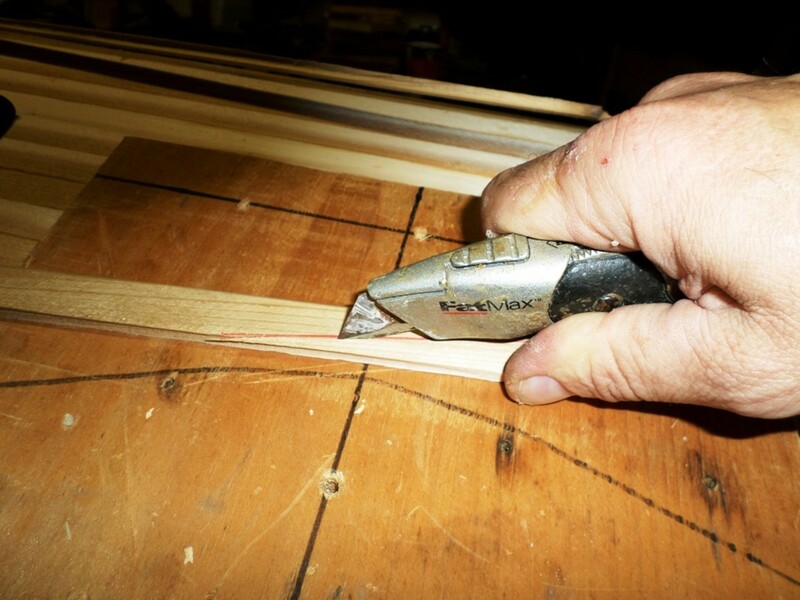 Cutting the angles and fitting the ends should be done carefully, this can be difficult. When you come to the last thin strip you will need to custom fit it into place. I used duct tape to make a template then cut the strip to shape. As with the lower half of the hull, now is the time for planning, sanding and filling cracks and gaps. If you used good quality strips of uniform thickness and good bead and coved edges, this process will be minimize. I cut and milled my own strips and had trouble maintaining consistent thickness, so the bead and coves were off also. 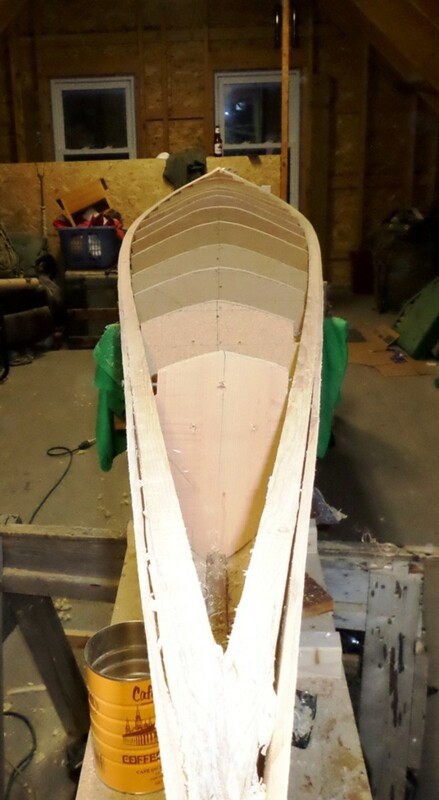 IF I build another boat I will cut the strips extra thick and use a thickness planer to make them consistent. I planed down edges of strips that were sticking up and coarse sanded the whole deck with 40 grit before applying filler. 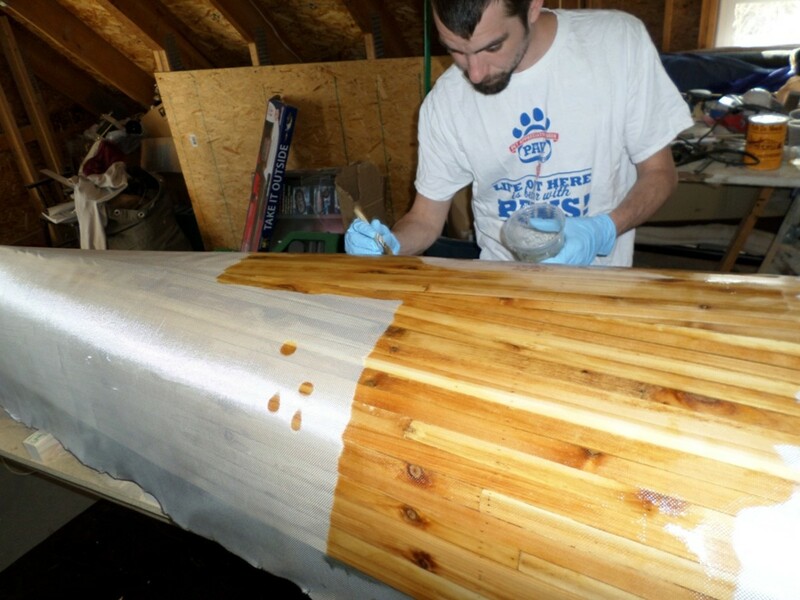 The filler is just epoxy mixed with sanding dust, which will appear darker than the wood. This can be worrisome but is usually blends in pretty good by the time the final coat of epoxy is applied. 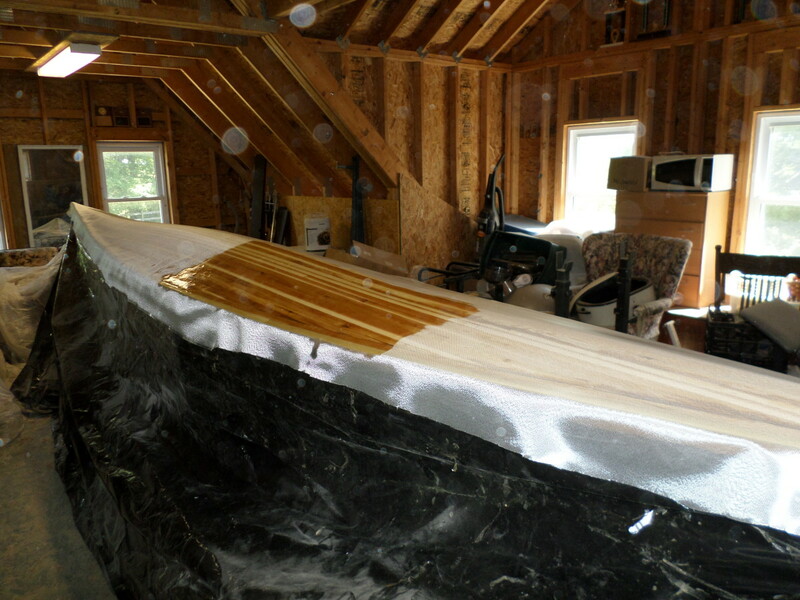 Once I was satisfied with the smoothness of the deck, the fiberglass was applied using the same process as before. Just a note here, it is desirable for the very best appearance to get the deck as smooth and free from variations and waviness as possible, but too much sanding and planning can make the wood too thin. As long as the wood feels fairly smooth to the touch, with no sharp ridges or other rough discontinuities, the fiberglass cloth is fairly tolerant to some waviness. 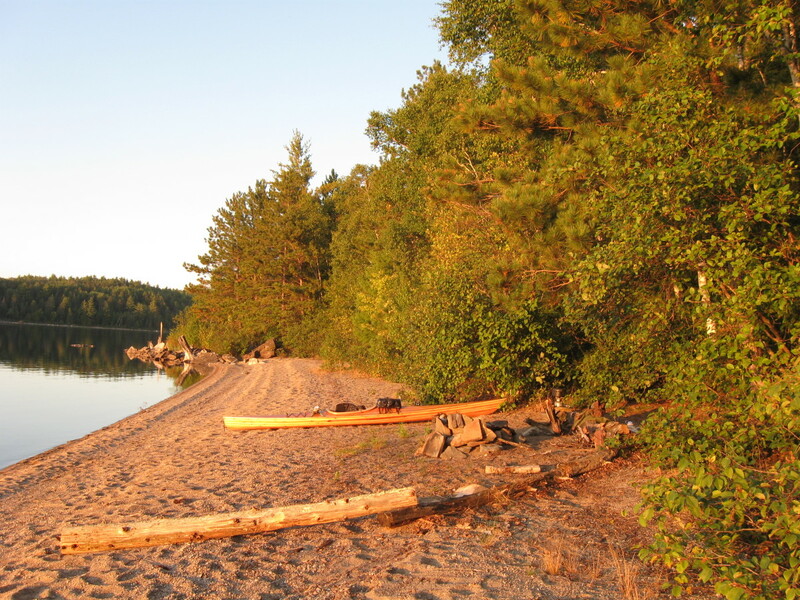 The flatness wood does not have to be perfect. 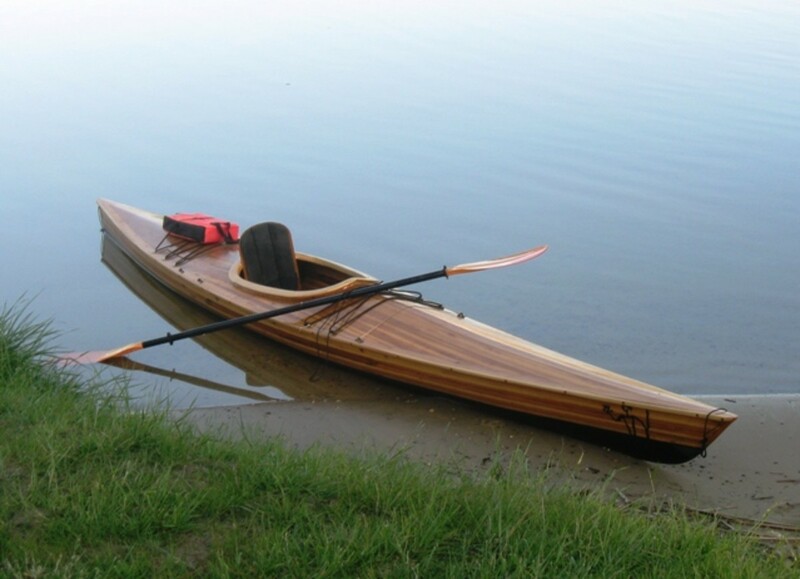 I decided to build another cedar strip kayak. 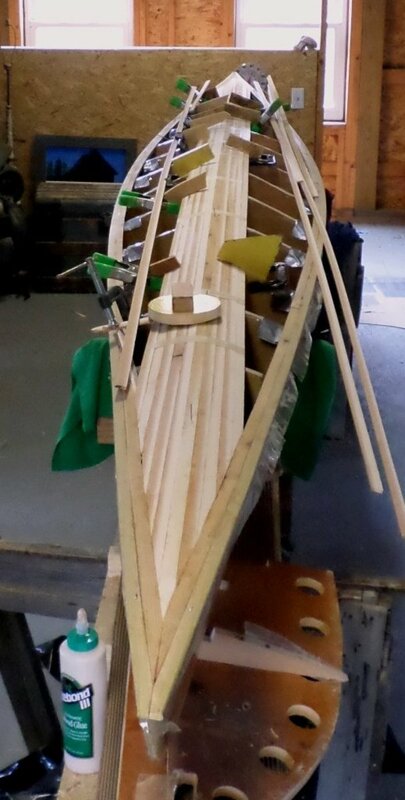 I’ve kind of had an itch to build another boat. 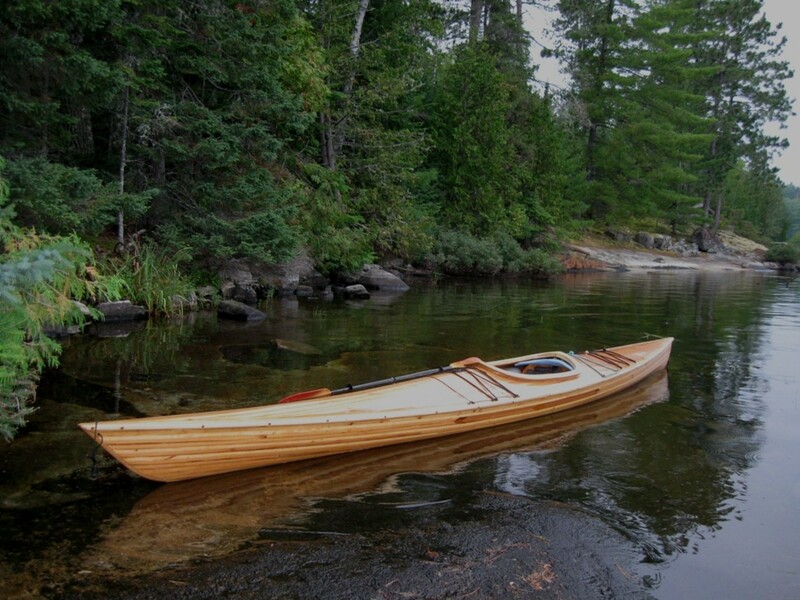 I previously built two cedar strip canoes and one cedar strip kayak. 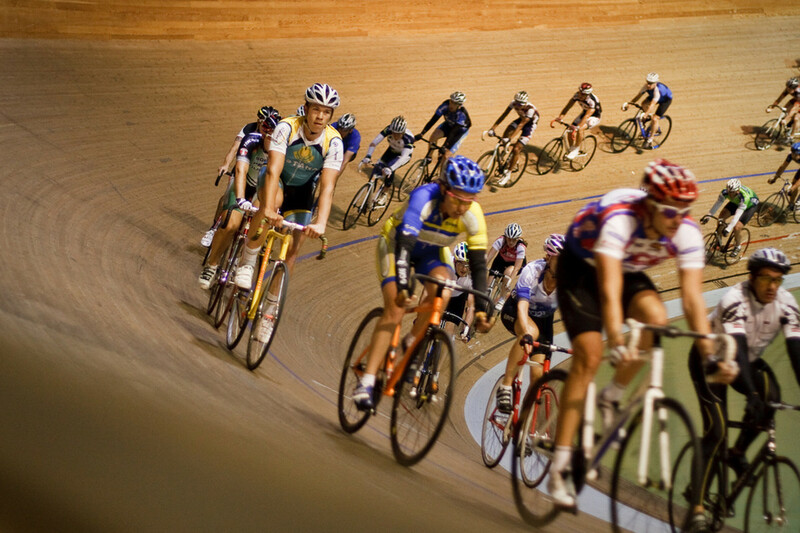 I want to take the less expensive route, so I will do some things to cut costs.